14 year-old David and Emily both live on a Caravan Park at Holkham Bay on the Norfolk coast. They live there with their dysfunctional parents, David with his dad Jim, the camps entertainer, and a man who makes embarrassing displays of affection towards his son in front of his nightly audience but rarely shows any when not on stage. Emily lives with her mum, Sharon, who works in the camp shop and suffers from a wee alcohol problem, a woman best described as common. When David discovers that his “best friend” Emily has to leave her home on the camp to go and live with her father when mum is deemed unsuitable to continue her care, he helps her run away and live in a nearby cave. But after their plans start to unravel, secrets come to light that transform their lives in away they could never have imagined. 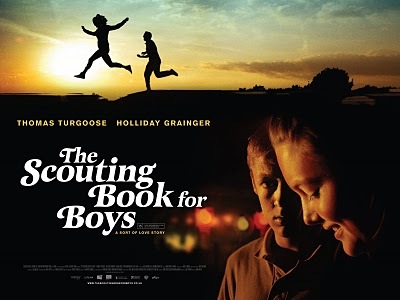 The Scouting Book for Boys (2009), the debut feature film from Tom Harper, is described by film critic Philip French as “a confident work of considerable promise” Certainly Harper knows how to bring the best from his two young stars Thomas Turgoose (This is England, Somers Town and Eden Lake) as David and Holliday Grainger, an actress primarily active in television, as the more mature Emily. These two up and coming young stars perform their roles with great conviction making their characters totally credible. The change of pace towards the end of the film will make you realise how effective Turgoose performance actually is, when a seemingly nice inoffensive young man can turn to the dark side when his feelings are thwarted. The film, whose tag line is “a sort of love story”, confidently displays the pains of adolescence and emerging sexuality. Filmed on location with a lot of charm by Robbie Ryan who was behind the camera for the British movies Fish Tank, Red Road and Brick Lane.